There’s been a lot of activity on the rooftop over the past few weeks. 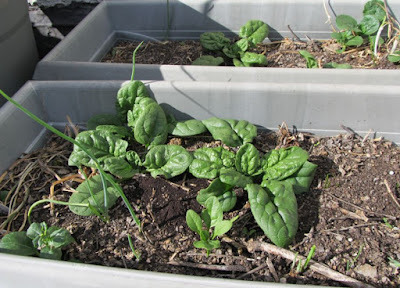 The snow peas are growing fast, the garlic is having a party, and the spinach is actually starting to look edible. 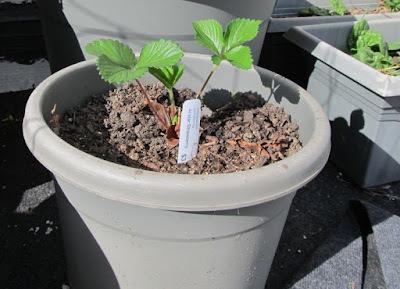 I also received a belated birthday present of five locally sourced strawberry plants recently. I only had four planters, but I had some extra space in one my mixed containers, so I’m going to try growing a strawberry plant in the same large container as some snow peas, spinach, and garlic. In the nursery, also known as the windowsill, progress has been a bit slower. Fewer than half of the seeds I planted more than two weeks ago have poked their heads through the soil. I’m not sure if I’m over watering, under watering, or if there’s another problem. But that’s OK — I planted seeds for more plants than I could possibly grow, assuming some plants would do better than others. 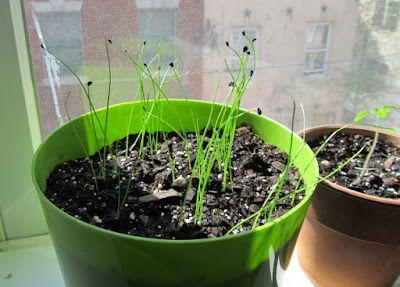 As things stand, as of April 20th, 2012 I’ve got two tiny yellow cherry tomato plants growing, half a dozen red pepper plants, and a fair number of little garlic chive seedlings. Unfortunately I’m getting the feeling that I should have planted every single one of these seeds a few weeks earlier, because I’m not certain they’ll be large and hardy enough to place outdoors when the weather is warm enough in May/June. But a lot can happen in a month or two. It will also probably be at least a few more weeks before the snow peas start blooming, so I’m not in that much of a hurry to rip them out and replace them with peppers and tomatoes anyway. I probably shouldn’t be surprised that the spinach is going to be the first plant ready to harvest. In fact, I think it might already be grown enough to snip a few leaves for dinner tonight. 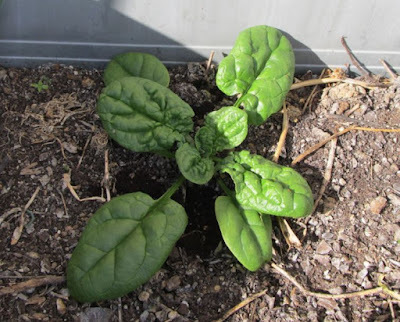 But since the spinach was one of my under performing crops of 2011 I’m pleasantly surprised. It’ll probably be a race between the snow peas and the garlic to see who’s ready to harvest next. 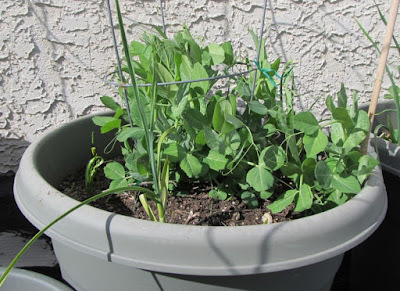 The snow peas are easy, because once they start blooming you just wait until the pea pods are as long as you’d like them to be and start snipping. The garlic takes a little more skill since you need to wait about 60-65 days from the time you plant and then reach down into the soil and pull them up by their roots and then leave them on rack in a low humidity room to dry out for a week. I should probably have done a better job of labeling the garlic I planted 4 weeks ago from the cloves I put in the soil 2 weeks ago… but I was counting on the fact that it would be obvious from the top which plants were most mature. Looking at them now though, I’m not so sure that’ll be the case. Either way, there’s a lot of garlic growing so I’m pretty sure we’ll have a good garlicky summer without spending too much money on the onion cousin at the farmer’s market. Meanwhile, after weeks of wondering what the heck the tiny little winged bugs swarming over my spinach and peas were, the answer is pretty much what I’d assumed from the start: gnats. 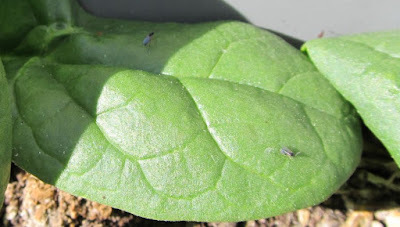 Fungus gnats, to be more specific. That photos shows a few of them… but I snapped the picture in the late afternoon. They swarm in larger numbers earlier in the day. You can also click the image to see a larger version. The gnats apparently like to chew on roots, which could explain why I didn’t have a very successful spinach crop last year — so I’ve decided to take action. I’ve got some Mosquito Dunks on the way, which are basically bacteria that you mix with water and pour over the soil to kill fungus gnats (and mosquitoes, obviously). I’ve also ordered some yellow sticky traps which apparently attract gnats with their color and then fill up with the little bugs as they fly to their sticky doom. 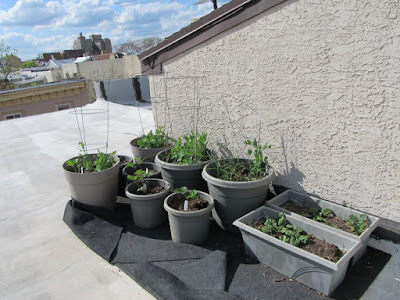 The strips I ordered are designed for indoor and outdoor containers, which comes in handy since I have some of each and there are gnats in both places (although the biggest infestation is in the containers on the roof). 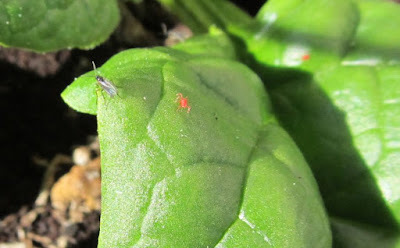 Some tiny red mites are also re-populating the garden. I saw a few last year, but they seem to be coming back stronger this spring. Odds are that they’re clover mites and nothing really to worry about unless they get into the house and start making a mess — if you step on them or squash them, they leave bright red streaks. I don’t know if the mosquito dunks and sticky traps will have any impact on the mites one way or the other, but I’m not all that concerned about them.